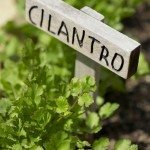 My cilantro will grow great to a point, then start turning brown. I read the info on this website, and I think I need to pinch it off sooner. Everything else I'm doing follows your suggestions. Pinching sooner will not harm the plant, so go ahead and pinch away.